Vinyl Collective posted the cover art for the upcoming Pinhead Gunpowder 7 inch vinyl record, pictured on the right. You can see a larger version by clicking here. 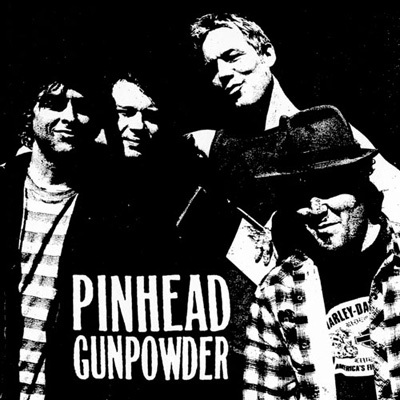 The record will contain the three new songs debuted by Pinhead Gunpowder at the live shows last February, and it is self-titled, just "Pinhead Gunpowder." We're waiting on more information as to whether the songs will be available in any other format besides vinyl. We'll let you know as soon as we know. There is no firm release date yet, but the record should be out soon, probably in the next couple weeks. For more info, check our earlier post with further details if you missed it, by clicking here.